This recipe is from "cooking with Pedatha". 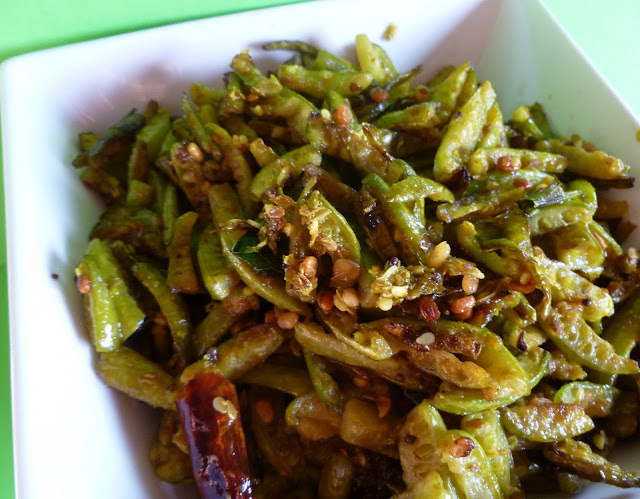 I have used kovakka ( tendli in hindi) where as she had used a different vegetable in the original recipe . This recipe will go very well with rice and very good for lunchbox too. Roast sesame seeds till golden , cool and coarsely grind and keep aside. Wash and cut tendli into half and slice thin. Heat oil in a big enough pan and add urad dal and when it turns golden add mustard. Lower the flame and add chilies , curry leaves , hing turmeric,coriander and chili powder. Add the vegetable and mix well and cook till tender. Then add sesame powder, jaggery and salt and stir . Cook for another 2-3 minutes and you are ready to serve. This dry preparation looks delicious. I love this vegetable... I can have this with rice and dal anytime! Tendli is my favourite vegetables,but never tried this way..looking very tempting..
Love this dear. Will definitely make it for my lunch. I liked your blog very much. Kovakka curry looks yummy and tempting. Wonderful presentation. Bharva Bindi / Okra stuffed with Spices.